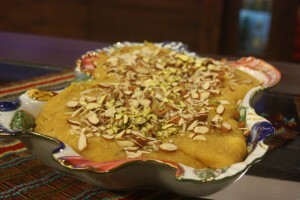 Chanay Ki Daal Ka Halwa recipe by maham at DesiRecipes.com. Put gram lentils in a pot and add milk. Cook on low flame. When milk dries and lentils become tender, blend. Heat oil in a seperate pot. Open cardamoms and add the seeds in it. Fry lentils continuously for 1/2 an hour. Then add sugar. After adding sugar the halwa will become thin but keep frying until it becomes thick again. Add whole dried milk and yellow food color and fry till more thick. Add 1/2 of the cardamoms' powder. When the halwa starts to bubble and leaves the side, remove from flame. Now put it in a serving dish and level it with spoon. Garnish with almonds , pistachios, remaining cardamom 's powder and the silver leaf.